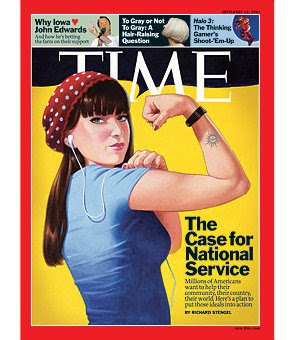 The recent call for national slavery, under the guise of "national service" by Barack Obama, Time Magazine and its editor Rick Stengel, the Target Corporation, Home Depot, and many businesses, organizations, celebrities (like Glenn Close and Kal Penn), the U.S. Military Industrial Complex, and various former Republican and Democratic politicians, is making quite a comeback. It also happens to be putrid and repugnant. It's even endemic of the ever-growing state and its tentacles in every aspect of our affairs. To require all persons in the United States between the ages of 18 and 42 to perform national service, either as a member of the uniformed services or in civilian service in furtherance of the national defense and homeland security, to authorize the induction of persons in the uniformed services during wartime to meet end-strength requirements of the uniformed services, to amend the Internal Revenue Code of 1986 to make permanent the favorable treatment afforded combat pay under the earned income tax credit, and for other purposes. (3) The term `national service' means military service or service in a civilian capacity that, as determined by the President, promotes the national defense, including national or community service and service related to homeland security. (a) Obligation for Service- It is the obligation of every citizen of the United States, and every other person residing in the United States, who is between the ages of 18 and 42 to perform a period of national service as prescribed in this title unless exempted under the provisions of this title. (2) in a civilian capacity that, as determined by the President, promotes the national defense, including national or community service and service related to homeland security. (c) Age Limits- A person may be inducted under this title only if the person has attained the age of 18 and has not attained the age of 42. (a) General Rule- Except as otherwise provided in this section, the period of national service performed by a person under this title shall be two years. (3) attains the age of 20. (2) physical or mental disability. (c) Training Capacity- The President may postpone or suspend the induction of persons for military service under this title as necessary to limit the number of persons receiving basic military training and education to the maximum number that can be adequately trained. (d) Termination- No deferment or postponement of induction under this title shall continue after the cause of such deferment or postponement ceases. But there's a very big concern here as well. This national service nonsense doesn't just apply to men; women are also its target as well. (3) by striking `he' and inserting `the person'. (b) Conforming Amendment- Section 16(a) of the Military Selective Service Act (50 U.S.C. App. 466(a)) is amended by striking `men' and inserting `persons'. This plan would coerce citizens during wartime to either become efficient killers in the Armed Forces during wartime or sheeple-like government employees under the phony umbrella of volunteerism (which is more like state-approved, state-sanctioned involuntary servitude). It effectively forces the citizen to be an indentured servant of the state. Slavery is rather an understatement here. Yet, the advocates of this plan conflate slavery with "volunteerism" and "voluntary action." Moreover, these conscripts make poor and lazy volunteers. There is no interest in doing the work, let alone "helping" the people whom the state wants them to assist. There is an inherent sentiment in conscripts that they should not sacrifice their lives to serve the state and carry out its interests, especially when these slaves lack the will to serve their fellow man at gunpoint and when they are the property of the statists to dispose of when they are surely expendable and can be done away with. What makes Congressman Charlie Rangel and his vile and diabolical agents of the state think that they can regiment an entire society that can and will be obedient to the state and to advance its interests on a whim? Fortunately, a Target employee named Jermaine Justice opposes this socialist war propaganda. Hopefully his speaking out against this malarkey can do some good, especially maybe convincing Americans that Barack, the Democrats, and the Republicans who support the institution of national slavery are evil, anti-American, and anti-freedom. Besides, if these goons really like the idea of national slavery, why don't they sign up for the war and help out their fellow man themselves? Why won't Barack, Stengel, and their sycophants send their families out to do such a service if such a thing is warranted, just, and moral? What are they afraid of? By the way, this "voluntary" national service program is very disingenuous and false. Citizens who support the idea of this program will be coerced into "choosing" which bureaucracy they can report to, not to decide whether or not they should support it voluntarily if it were the province of the free marketplace. Besides, such a program requires taxes to fund it. Hence, how is this program "voluntary" if taxation will be employed to force Americans to pay for it, whether they like it or not? Sadly, too many Americans do support the idea of slavery in this country. This is contrary to the ideals and principles of a libertarian society under which the people of the county once labored. This is no longer a country that is free, because a truly free society requires a voluntary commitment to free enterprise, personal responsibility, and complete individual liberty. America, as it stands today, is now far from that.